A simple tapa, easy and cheap but good. It's popular in the bars of La Mancha, Spain's windy central plateau, where the gallant Don Quixote waged war on windmills. The colder the winter, the hotter the dressing. Perfect with a handful of olives and a slice of manchego cheese. 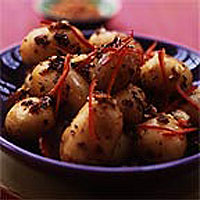 Cook the potatoes until tender in plenty of salted water. Drain and toss over the heat to dry and split the skins a little. Meanwhile prepare the dressing. Heat the oil in a frying pan and add the garlic. Fry gently for 2-3 minutes until the garlic softens. Sprinkle in the chilli, cumin, marjoram and paprika. Then add the sherry. Bubble up and sprinkle in the sugar. Fold in the potatoes, turning to coat thoroughly. Pile in a dish and toss with the rough salt. Prepare the finishing breadcrumbs (known as migas in Spain). Heat the oil and fry the chorizo, if using. Remove and reserve once the corners have crisped a little and the oil has taken the colour. Sprinkle in the breadcrumbs and fry until crisp and golden brown. Toss in the chilli strips and reserved chorizo, remove from the heat immediately and tip the contents of the pan onto the potatoes. Toss lightly. Serve with cos lettuce leaves for scooping and pickled jalapeño chillies on the side.